Bring the water, oil and salt to a boil in a medium saucepan. When the water just begins to boil, add in the rice flour and stir with a wooden spoon. Once the water and flour are well mixed, just let the dough hang out in the pot until it cools enough to handle with your hands. Knead with your hands for about a minute. The dough with start to get gummier and hold together better. Cover the bowl with a tea towel or plate so that it doesn’t dry out. Heat a tava or a cast iron pan (any kind of pan will work if you don’t have a tava or a cast iron pan) over medium low heat. Let it heat while you roll out your first rotli. Break off a golf ball sized piece of dough, knead it in your hands a few times and form a disk. Roll the disk into the rice flour and roll out to about 1/32? thick. Carefully transfer the rolled out rotli to the pan. Let cook until you see bubbles start to form. About a minute or two. Then either using your fingers or a pair of flat tipped tongs flip the rotli. Let cook on the second side until you see more bubbles form. Another minute or two. Makes about a dozen 6 to 7 inch rotlis. When you are rolling out the rotli, use light pressure from the center out. 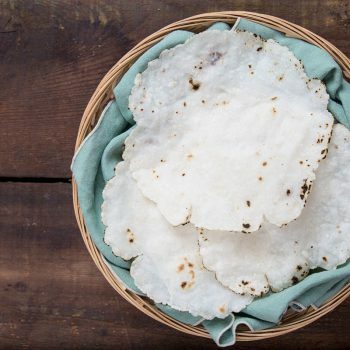 If I had a tortilla press, I would definitely try to use it with this recipe. I think it would work great. Update 12/20/13: These rotli are served with this simple pea saute.